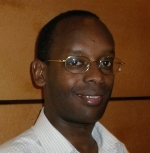 Jean-Damascène Gasanabo has a Ph.D. in Education from the University of Geneva, Switzerland (2004) and is the author of a doctoral thesis pertaining to the analysis of history textbooks and the construction of exclusive identities in Rwanda from 1962 to 1994. After his doctorate, he worked with UNESCO in Paris as a Consultant in Education Sector for the project “Fostering Peaceful Co-Existence through Analysis and Revision of History Curricula and School Textbooks in South-Eastern Europe” (2005-2006) as well as collaborating as a Programme Specialist for “The United Nations Secretary-General’s Study on Violence against Children” (2006). From October 2006 to August 2008, he was Head of Support for Communication, Research and Special Projects at Geneva Call, an international humanitarian organisation. He is now back to UNESCO Headquarters in Paris as a Consultant in the Sector of Education for the projects “Education for Holocaust Remembrance” and “Prevention of school related gender-based violence in post-conflict countries: from African case studies to international cooperation” as well as in the Sector of Social and Human Sciences where he is responsible for producing Policy Briefs for the Management of Social Transformations (MOST) Programme. He has published various articles and contributed to a number of collective works including “Rwandan Genocide: Sociological, Economic and Psychological Consequences”, in Afro-Asian Conflicts: Changing Contours, Costs and Consequences, edited by Seema Shekhawat & Debidatta Aurobinda Mahapatra, (New Delhi, New Century Publications, 2008), pp. 193-216; “Le génocide des Tutsi du Rwanda” (co-authored with Jean-Pierre Chrétien), in Barbara Lefebvre & Sophie Ferhadjian (eds. ), Comprendre les génocides du XXe siècle (Paris: Comparer –Enseigner, Bréal, 2007), pp. 130-153; “School History and Mechanisms for the Construction of Exclusive Identities: The Case of Rwanda from 1962 to 1994”, in UNESCO-IBE, Textbooks and Quality Learning for All: Some Lessons Learned from International Experiences (Paris, UNESCO-IBE, 2006), pp. 365-404 and “The Rwandan Akazi (Forced Labour) System, History, and Humiliation,” Social Alternatives (Special Issue ‘Humiliation and History in Global Perspectives’), University of Queensland, Australia, Vol. 25, No. 1, First Quarter, 2006, pp. 50-55.